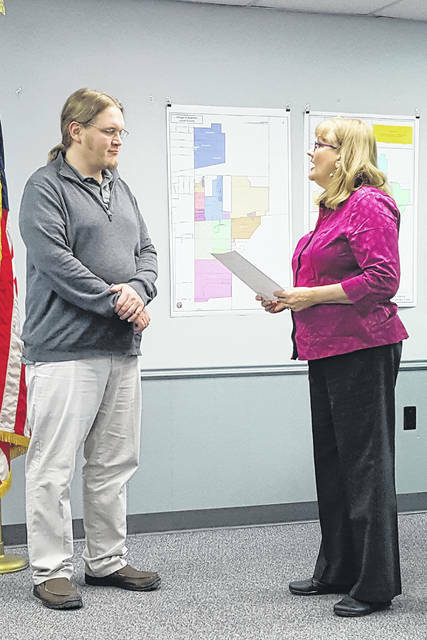 Swanton Public Library Director Adam Walter is in attendance as Swanton Mayor Ann Roth reads a proclamation for National Library Week during last week’s council meeting. The Village of Swanton is still working toward an agreement on refuse service. The village has asked for a 60-day extension to the contract with Republic Services, which expired at the end of March. China has drastically limited the amount of recyclable materials accepted from other countries. Plastic scrap imports to China were down 99 percent in 2018, and other Asian countries are also limiting imports. Village residents currently receive trash pick-up once a week and recycling pick-up every other week. Also at the meeting, Council approved vacation of a paper street to make way for senior housing. Council approved, by emergency, vacating Crossings Way Court, a paper street that had been planned off of Munson Road, just north of the railroad tracks. Vacating the street helps to clear the way for the Swan Creek Crossing senior housing community. Previously a two-lot replat of the site had been approved by the Swanton Planning Commission. The 28-unit building for those ages 55 and up is slated to open in 2020. Near the beginning of the meeting, Mayor Ann Roth read a proclamation for National Library Week, April 7-13, stressing the importance of libraries. • Ordinances declaring the necessity to assess properties for street lighting and leaf collection. This is the annual first step in the assessment process. • The final reading of an ordinance to vacate the unimproved portion of Roosevelt Street and an alley. • The first reading accepting annexation of land on petition by Elizabeth J. Lambert. The property is located on Scott Road. The annexation was approved by Lucas County Commissioners on Jan. 15. • An agreement with Sharon Cargill to to perform landscaping services in town. Village resident Harold Behrendt spoke before council to voice his opposition to the vacation of Peter Street. He told council he could lose access to his garage if the street is vacated. Council members will likely decide at their next meeting whether to dedicate land between the laundry mat and village annex/community center on Chestnut Street to be the future site of the proposed train viewing platform and relocated Brailey Depot. Individuals have expressed interest in donating to the project, but will not until there is a formal motion.